Posted by Shelley Grell on December 11th, 2015. 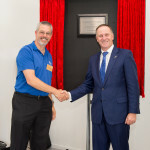 Press release, 11 December, 2015, TE Connectivity, Christchurch, NZ: TE Connectivity Christchurch, one of 80 plants owned by TE Connectivity worldwide, has been supporting local industry with contract electronic manufacturing services for many years. On Thursday 10 December 2015, the Prime Minister of New Zealand, the Rt. Hon John Key, officially opened TE Connectivity’s brand new facility at 14 Mary Muller Drive, Hillsborough, Christchurch. TE Connectivity Plant Manager with the Rt. Hon John Key. TE Connectivity’s New Christchurch Facility. The building has been custom designed to meet very high standards and to enhance employee health and wellbeing with a light, airy, flexible, and futureproof fit-out. It also takes advantage of its spectacular surroundings, with huge windows that enable all staff to enjoy a breath-taking view of the Port Hills. Read the TE Connectivity Press Release.